I'm remodeling my upstairs bathroom with stone tile and I'm not sure my contractor is doing the work that needs to be done. I have 2x8 16" on center with an 11' 4" span. After some online searching by me, I found that 11'4" is outside the stone tile deflection. The tile place said it would be fine, but I mentioned it to the conractor. He had a guy add 2 more 2x8s under the bathroom floor. The way it was done, I'm not sure does anything. On one end, they rest on a basement wall that I don't believe is a load bearing wall. In the middle they are nailed to the existing 2x8x. On the outside wall side, there is an electric wire running, so he notched in from the side (about in the middle of the joist) about 6". The other one he cut out the bottom of the board so that it now doesn't rest on the outside wall. Did this do anything to help? I'm not handy and am getting worried, so any input will be greatly appreciated. Last edited by kcrosby; 06-23-2011 at 07:59 PM. Here is a picture of the end on outside wall with notches. As long as the notch does not extend to or past your support wall. The shear strength is what is the most important. That is the cross sectional area of your joist at the edge of your support wall. If the notch is past the support wall then your cross sectional area is the thickness of wood between the notch and the the support wall. Both notches go past the wall support although I'm not sure they had to; I would have to take another look. I would suggest going to a local home ceter and ask if they have anything like a truss plate. It is a perforated steel plate with sharp barbs, on one side that would be hammered into the wood. Possibly using a pair of these, one on either side of your joist, in conjunction with a polyurethane construction adhesive. If you push your electrical as far back as possible then place one truss plate on either side using a 2x6 or 2x8 piece of wood, sandwich the joist using a C-clamp to sink the metal barbs into the wood. I would spread the polyurethane construction adhesive on the barb side of the truss plate first. It would probably be a good idea to align the bottom of both truss plates with the bottom of your joist and try to center them on the edge of the horizontal 2x that your joist is on. The method used to notch the joist appears to be far out of standard practice, and effectively useless. Since the notch appears to extend beyond the support point, as soon as you load the joist by standing on it, the joist will deflect downwards, and will be resisted by only the 1 inch or so thickness of bottom support. It is likely to crack at the hinge point very quickly, making it totally useless. This forum has had numerous discussions over the past two years about proper notching and drilling of holes, I suggest you do a search. Every code has standards for notching and hole drilling, this technique is not approved by any code that I am familiar with. If you in fact need the extra joist for stiffness, I would have the workers remove this one and replace it with a properly installed joist with an appropriately drilled hole for the wire. My guess is that the workers did not want to temporarily remove the wire so they could put it through a hole, so they cut a bastardized notch to make it work. No good. That is too much taken out of the joist. You need to pull that wire and place a sister joist at that spot. 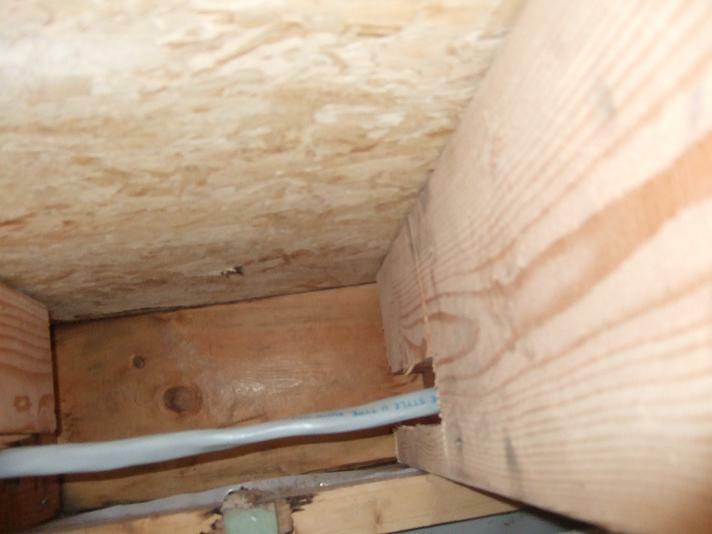 To correct install wiring, only a hole needs to be bored, not a chunk that takes enough out to weaken the beam, which it is obvious that some has done that. Any other areas you can see that Bubba had his cousin did hack work on the joists? That again is no better than what the person that hacked this did. It is not the proper way of fixing. He had a guy add 2 more 2x8s under the bathroom floor. Why just 2? You think that's going to help? Bathroom on floor above is 5 feet wide. Joists run parallel to bathroom length. The joist to the left of these two is already doubled. He just worked there. Before I left for work, I told him I thought the wire should be pulled and maybe a junction box added. The extra support was added so that I could put stone on the floor above. Current construction doesn't match the 720 I need for stone deflection limit, but is fine for ceramic 360.
butchered sistered 2x8. The added 2x8 will add some load carrying and the 2x6 should get you where you need to be. Maybe Daniel Holzman will chime in and let you know if this will work. When a load carring joist bends it's usally in the middle, not the end. Don't get me wrong, I would rather see the sistered joist done correctly, but I think you may be able to repair your problem. Also it looks like you have chip board for a sub floor, it should be exterior grade ply wood. WOW! Nice hack job LOL..
Easy fix if you have some time.. I'd recommend you remove that joist, but that is time and time is money..
You first off need to rip a piece of 2x4 to fit inside that notched out joist. Hit new ripped piece into the slot and make sure it is tight. That will help pick up the load and carry it through the notched section. Once that is finished, you need to pick up some 5/8 - 3/4 inch plywood, whatever is more in your price range. Now I would gusset your joist for the first 4 feet. Rip a piece of plywood to 7 1'4 inches (depth of your 2x8) and notch out the hole vertically. DO NOT cut with the grain like the other person, this time cut the notch 1'' wide and up as little as you can until it fits good without pinching your wire. Now nail the CRAP out of the plywood gusset. I would use 2.5 inch nails and put 4 rows every 4 inches into the plywood. You now have a super strong fix..